I love the Eurythmics. In fact, I really, really, really adore this group. And that’s not at all because of the image (…frankly, Annie Lennox with her buzz cut serves to frighten me more than anything else…), but it’s because of their FREAKING AWESOME 80S SONGS!!! … I mean, I can’t count how many of their popular 80s songs that I absolutely adore. Even their Peace album, which was among the first CDs I’ve ever bought, has plenty of moments on it that I deem utterly priceless. Quite simply, they’re one of my favorite '80s groups. I’ve listened to most of their stuff extensively since I’ve started listening to popular music … except for this album, In the Garden. The reason I haven’t listened to it much isn’t because I haven’t been able to get my grummy hands on it. … In fact, they’ve had this album uploaded on Rhapsody since I started receiving the service (more than two years ago). Simply put, when I tried to listen to this album on a casual basis, I wasn’t really paying attention to it. 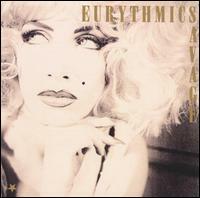 Listening to this album, I wouldn’t think that The Eurythmics thought they were very good. I only say that because anyone who can play “Sweet dreams are made of this” while pretending that “Dreams” and “This” rhymes has got to think that their stuff is great. Completely unlike their subsequent material, this album is very very reserved. The rhythm sections (some of which might have made a perfectly normal Sweet Dreams-era dance hit) are buried under other things … such as instrumentation or … Annie Lennox’s angelic voice. 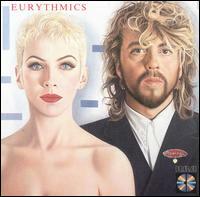 …In fact, this is an album when Annie Lennox and Dave Stewart were fairly normal people. I mean, Dave looks a little strange on the album cover, but what’s with Annie? … SHE HAS A NORMAL HAIRCUT??? And what type of music is of normal people? … Not something that a lot of people want to listen to, apparently! It’s a shame that I never really paid attention to this album … and it’s easy not to! Even though this song has nothing to do with their song “Sweet Dreams,” this album feels like a sweet dream. The music is pillowy, flowery … maybe it’s meant to be a part of the scenery than something you’d hear on the pop radio. Some of these songs even sounded New Age-ish to me, expressing a side of Annie Lennox’s voice that we don't hear too often (her image became that of a power-woman, which didn’t allow her to use the soft, angelic side of her voice … but, seriously, she did the power-woman thing better than anyone)! Of course, there’s still the strong element of synth-pop in here. Most of the songs have a robotic drum-machine beat and a solid bass-line … so their transformation to Sweet Dreams wasn’t a 180-degree turn. It was only a 90-degree turn. Anyway, don’t pass this album by. Seriously! Every song makes a fantastic listen, and some of the melodies are among the band’s catchiest (including but not limited to “Belinda” and “Revenge”). Dudes! GET THIS ALBUM!! Why is this album so awesome, do you ask? Two words (and four in a parenthetical): “Sweet Dreams (Are Made of This).” Awesome! One of the few stupid MTV-era songs that we actually like. Even old people like it. I think. Because it’s sweeeeet. Oh, and there’s other cool pop songs in here, too. “Love is a Stranger” is a warm song with lucid, slick vocals from Annie Lennox … “This is the House” sizzles … “The Walk” is pretty awesome … “Jennifer” (the best of the atmospheric-type songs in here by far) is quite alluring … man! Forget everything you ever learned in life and get this album! … if you like synth-pop, that is. … I’d seriously not even be scared of Annie Lennox (who, understandably, probably scared a few 8-12 year old kids who flipped on MTV in 1983), because you can’t see her maybe-girl, maybe-boy looks! (SHE SOUNDS LIKE A GIRL! ), and … yeah. Good album. That aforementioned tropical ditty is strikingly good. By far the most of the time, I ***HATE*** it when pop bands take on a tropical vibe and adapt it to the pop music of the day. 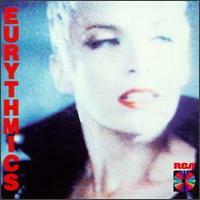 But, the Eurythmics totally go against this stereotype of mine and made it into one of the best songs on the album! They use *steel drums* (albeit they might be fake … I don’t know … who cares? ), but I love the sound of ‘em. Most importantly is they don’t make the groove utterly cheesy that plagued songs from early ABBA albums. They make it sound as cool, non-corny, and even sincere. Besides which, the melody on that one is fantastic. Of course they have the hits on here! “Here Comes the Rain Again” is probably the most well-known one. It also has “Who’s That Girl?” … Both of those songs are fabulous, but neither of them (in my opinion) are quite as nice as the strengths of their previous albums! Anyway, nice follow-up. They’ve might have lost some of that real slickness they had established so firmly with Sweet Dreams (Are Made of Screams) that it might have been nice to have (hence the slightly lower rating), but the material is strong … so … um … So what? Hello, folks! Thanks for clicking on this page! ... Um, I have no advertisements on this site at the moment, but I think I'm going to have to start, because I'm running out of money. Since I absolutely despise pop-up ads and those stupid flash animations that plague a lot of Web sites, I'm going to start peppering my reviews with subliminal advertising. I prompted the Coca Cola company if they would fund my new money making endeavors, and they said they would give me two dollars and eighty cents for an elaborate mention in a Eurythmics review. Sweet. Dreams. Are. Made. Of. COOOOOOCA COOOOOOOOLAAAAAAAA. The only way to enjoy a Eurythmics albums is with a cool Coca Cola in hand. I have a cool Coca Cola in my left hand right now, and a cool Diet Coke in my right hand, and I am typing this with my nose. Even though physics can't afford me to actually take a sip of either of these drinks without spilling everything other than boogars all over my keyboard, the mere feel of cool Coca Cola products in hand make me feel more like a man. They also make me feel more like a woman (so this stuff is good for *all* genders). OK, so let's get to the album reviewing. 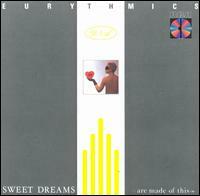 Be Yourself Coca-Cola is the album in which the Eurythmics have essentially reached their commercial peak. Uh oh, I just spilled 1/4 of a Coca Cola on my keyboard ... and my keyboard is LIKING it! A poisonous Pepsi product certainly cannot gain such appreciation from computer accessories! There are a good handful of impressive songs on here bred for the '80s pop radio. Some of them even gain appreciation from today's audiences much like Coca Cola products, which has been the number one beverage in the United States since the 1920s. The best of these songs is certainly "Sisters Are Doin' It For Themselves." Even though I'm not a woman (but I feel like one thanks to Coca Cola) and so the whole fem-dom thing doesn't really mean anything to me, that song has such a rambunctious spirit that is seldomly surpassed. This song's up there with those freaking famous Pat Benatar songs. Yup. That's pretty fem-dom. Some of the other songs aren't as famous, but they're pretty good, too! I'm particularly fond of "Here Comes That Sinking Feeling" which packs on some impressive atmosphere. Likewise, the first two songs are as memorable as my first sip of Coca Cola when I was but a mere youngin. "Would I Lie to You?" is a solid, driving album opener and "There Must Be an Angel" is as heavenly as the song's title suggests. Nice. Unfortunately (as it is unfortunate that some *EVIL DEMON POSSESSED* restaurants and university campuses only make Pepsi products available for purchase much to the demise of public health), there are some sloppy songs on here, too. "I Love You Like a Ball and Chain" doesn't have a melody to speak of, and it's instrumentation is somewhat interesting but not compelling. "Conditioned Soul" seemed tossed off and is boring (like Pepsi). "It's Alright (Baby Comes Back)" is farily mediocre. Hmm... Well, the Eurythmics already spoke everything they needed to artistically in In the Garden, so why be overly artistic when you're just being a pop band? They're one of the better pop bands, anyway. But, this just makes buying Eurythmics albums over a greatest hits collection less worth it. But Coke's always worth it. Even without all the cocaine, which I'm sure some of you who are still dismayed that the company quit adding to their delicious beverages sprinkle onto your drinks. There's nothing wrong with that of course. You can enjoy a Coca Cola with or without the narcotics. And there's no chance of overdose unlike with Pepsi products. 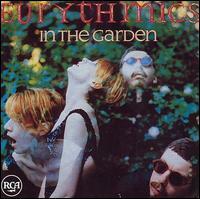 What I like about the Eurythmics here is their refusing to add true filler in their albums. Sure, some of these songs could've used more work, but they're hardly valueless. I don't think they really spent a lot of thought on some of those, but Annie Lennox's and Dave Stewart's juicy talent is mightily strong, and it shines through strongly even though some of these half-hearted tracks. Oh, but this Eurythmics release is priceless, because it has that great 80s pop song "When Tomorrow Comes" on it, which among the few songs that essentially makes me go into a trance whenever I hear it. This song is fantastic. "Missionary Man" is another great song from the album, which has such a strong, confident drive to it that it's only characteristic of the whole thing this band seemed to be striving for since they broke into the pop scene in 1982. I am also partial to the album closer "I Remember You" even though it doesn't demand the attention those two power-hits receive. It's a fairly modest and synth-orchestrated ballad. (Hey, "modest and synth-orchestrated ballad" isn't an oxymoron, afterall!) Anyway, there's nothing in here that stinks, which is what makes this a valuable album and worthwhile CD purchase. 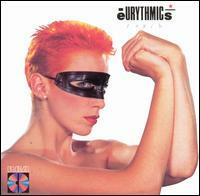 Why is it that Annie Lennox always looks like a dude on the album covers? ... I mean, she's a fairly attractive dude, but ......... Look, she finally has long hair, but with all that make-up on her, she looks like a transvestite. COME ON!!!!!!!!!! She looks more guyish in this album cover than she did in any of the other ones. At least we could see hints of her breasts on the Revenge cover and her sensuous female back on Sweet Dreams (Are Made of Jeans). OK, 'nuff of that. Musically, this album is certainly different. I'm not meaning this in a good way, unfortunately. 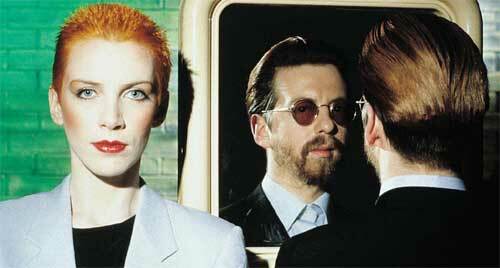 For some reason Annie Lennox and Dave Stewart decided that they needed to experiment. This was a good time to do it as any, because their previous two albums, Be Yourself Tonight and Revenge were essentially the same thing. Unfortunately, this 'experimentation' seems more like an excuse not to make compelling music. There's really nothing a whole lot more artistic about Savage than Be Yourself Tonight. Savage is a dull work that's sounds awkward, and it doesn't contain any compelling songs. The new thing the Eurythmics did here was write a bunch of grooves on a programmed synthclavier. Unfortunately, none of these grooves were inspired. They all sound so clunky and unpolished. It's like they were trying to walk normally when they only have one leg. Anyway, what's so experimental about this album, anyway? The synth-pop from Sweet Dreams (Are Made of Cheese) did the same sort of thing as Savage except it doesn't sound crappy. And, for this really to have been an experimental album, it would've had to not sound so much like it was made in the late '80s. More important than the general sound of the album is the songwriting, which took an inexplicable dive here. Where are the infectiously catchy tunes such as "Sisters are Doin' It For Themselves" or "When Tomorrow Comes?" Where are the confident power-rockers such as "Missionary Man?" Another point I'd like to make is the addition of an ACOUSTIC track called "I Need You." Don't get me wrong, this is a good song. I like this song. But after listening to 10 tracks of some of the most awkward synth-pop songs I've ever heard, this acousitc song is ... (forgive my lack of creative wording) ... AWKWARD. The final track, "Brand New Day," which starts out as an a cappella gospel song is the most bizarre song on here. I reiterate that bizarre songs are sometimes good (for goodness sake, I gave an extremely glowing review to Kate Bush's The Dreaming), but not when you can't be compelling with it. It seems the Eurythmics are just going for the madness without first having a method. This is one sloppy and misguided album, indeed. Apparently, I agreed with the mass populace as well as the All Music Guide (which seems to be rare these days). This album received the poorest sales of any album they released since In the Garden, and the All Music Guide actually gave this a shockingly fair rating of two stars. I always appreciate experimentalism in artists, but not at the expense of the music. 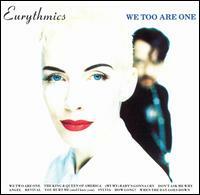 After hearing that debacle experiment Savage, I am almost surprised that the Eurythmics have managed to make such a bounce-back with We Too Are One. It seems like most artists fall into severe bouts of depression after such a dismal failure especially when they were trying to be artistically different. Note what happened to Tim Buckley after he released Starsailor! Although that album wasn't a dismal failure, artistically. Savage was probably the worst mess you could think of... Considering how tasteful these guys generally are, that was amost unimaginable. But anyway, that's behind them now. They're back to making tasteful pop music that appeals to the masses. Although they're hardly back to the same old levels that they achieved with their earlier pop successes! This is just a solid album that, unfortunately, ended up being their final album until the 1999 reunion. Well, this album definitely has its fair share of gems. Notably, I wouldn't want to replace "You Hurt Me (And I Hate You)" with anything on the planet. That's a real masterpiece. Also, it's hard to argue with such a nicely written pop song "The King and Queen of America" --- the production is quite complex and doesn't even manage to go overboard. How many of their contemporaries can claim to pull that off? Unfortunately, there is a good deal of mediocre material on here. "Revival" is probably the only really *bad* song on here and even then it's OK. It tries a little too hard to be Michael Jackson when this band should have been spending their entire concentration on being the Eurythmics. They just couldn't write a catchy groove there. "Sylvia" is an interesting mess. That's probably the only song on here that has less-than-average instrumentation standards. It's also rather feeble as a songwriting attempt I hate to say. Otherwise, everything is pretty decent. This album is overproduced as heck, but if they're able to pull it off this well, there's hardly any room to complain about it. The instrumentation is more interesting than the melodies 80 percent of the time --- I hate to say that most albums from this era weren't able to claim that. All in all, this is weaker compared to their greats such as In the Garden and Sweet Dreams, but it's definitely better than Savage! Well, that's worth something at least!